Banish that foul odor, stat! 1. Pick the right material. 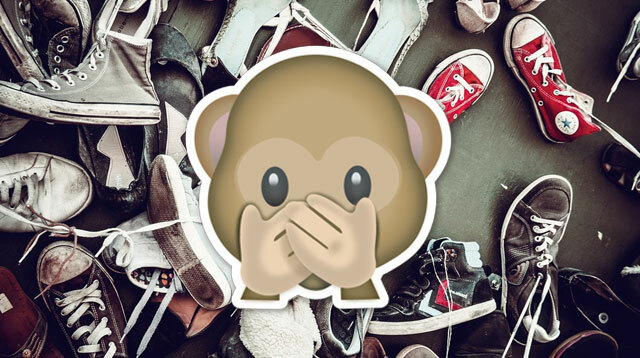 If you have notoriously stinky feet, choose a breathable fabric when buying shoes. Cotton, linen, leather, and hemp are the best picks. 2. Let them rest. Avoid wearing the same pair for two days in a row. Alternate with another pair to give the other time to air out. 3. Keep them dry. Never store them while still damp. When your shoes get drenched in the rain, don’t be tempted to place them in direct heat like the dryer. Loosen the laces, take out the insoles, and let it air dry naturally, even if it takes hours. For faster drying, place a crumpled newspaper inside. 4. Clean properly. For light grime, rub it off with a damp cloth. For mud and stubborn dirt on gym shoes, brush it off with an old toothbrush and warm water mixed with laundry detergent. Rinse and let the shoes air-dry before storing. Never toss them in the washing machine or dryer—it will damage your shoes! When in doubt, Google or read the labels. 5. Wear the right socks. Trapped moisture is often the cause of fungus, bacteria, and foul smell. For sneakers, opt for breathable cotton socks or moisture-wicking running socks. If you have sweaty feet, avoid going sockless when wearing ballet flats or pumps. Look for no-show socks. 6. Check your insoles. It may be what’s causing the offending odor. Take the insoles out at the end of the day to dry out. If they smell funny, launder and dry. You can replace generic insoles with odor-control and anti-microbial ones. 7. Powder. Sprinkle some baby powder or baking soda in your shoe and let it absorb the smell and moisture overnight. Dump out the grimy powder the next day before wearing your shoes. 8. Citrus peels. Deodorize by placing fresh orange or lemon peels in your shoes overnight. 9. Shoe spray. Use shoe deodorizer or linen sprays, but if you’d like to save a little money, go DIY. In a spray bottle, mix equal parts white distilled vinegar and water, or alcohol and water, and then lightly spray to disinfect your shoes. 10. Recycle paper. To absorb odor and help newly washed shoes dry faster, crumple coffee filters, newspapers, or brown paper bags into the shoe. 11. Freeze. When traveling and you have no time to wash your smelly shoes, place the pair in a Ziploc or plastic bag and leave in the freezer overnight. Give the shoes time to thaw in the morning before using. Note that this will only temporarily get rid of the smell. The odor will return in a few hours to days, so wash your shoes when you get home. 12. Essential oils. Instead of applying directly to the shoe fabric, apply a few of drops of your scent of choice to a cotton ball, and then leave it in the shoe overnight. 13. Kitty litter. Got cats? Fill up an old pantyhose or a pair of stockings with unused cat litter. Knot the ends and place one in each shoe overnight to neutralize the offending smell. 14. Silica gel. You know those silica gel packs that come with your new box of shoes? Don’t throw them away. If you’re storing your shoes in the original box, the silica gel will wick away moisture and odors. 15. Tea bags. Don’t throw away your used tea bags. Let them dry, and then place them in your shoes overnight to absorb the smell and unleash a fresh, woodsy scent. 16. Dryer sheets. Use them as extra lining when wearing sneakers or sports shoes. 17. Deodorize your feet. If you have a fungal infection like athlete’s foot, use anti-fungal powder, medicated foot powder, or an organic treatment like tea tree oil. For extra sweaty feet, use foot powder or a gentle foot mist. Don’t overdo it. Remember that strong perfume mixed with BO produces the worst smell. 18. Maintain good foot hygiene. You can’t mask the bad odor forever, so nip it in the bud! When you bathe, scrub and clean your feet well. Make sure your feet are thoroughly clean and dry before wearing socks and shoes. Don’t wear closed shoes 24/7. If they smell and look funky too often, have your feet checked by a doctor to make sure you don’t have a fungal infection.